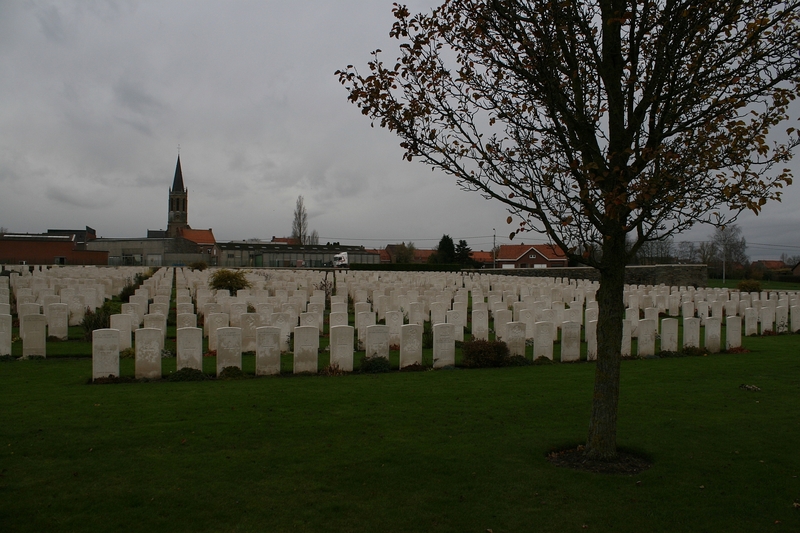 A few weeks before Christmas, the family Baldrick & I revisited* Zandvoorde and the British cemetery there. Last time it was a beautiful summer’s day, blue sky, fluffy white clouds. 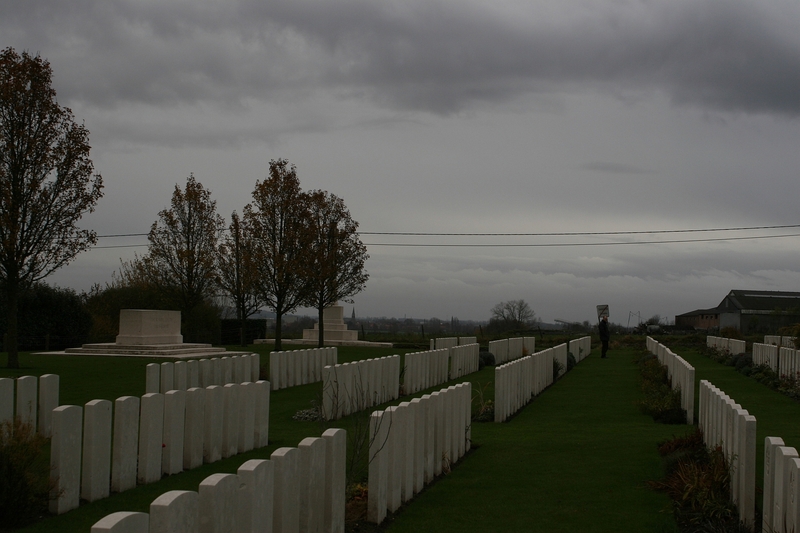 Not so nice today, but a good opportunity nonetheless to rectify some omissions from our previous visit. 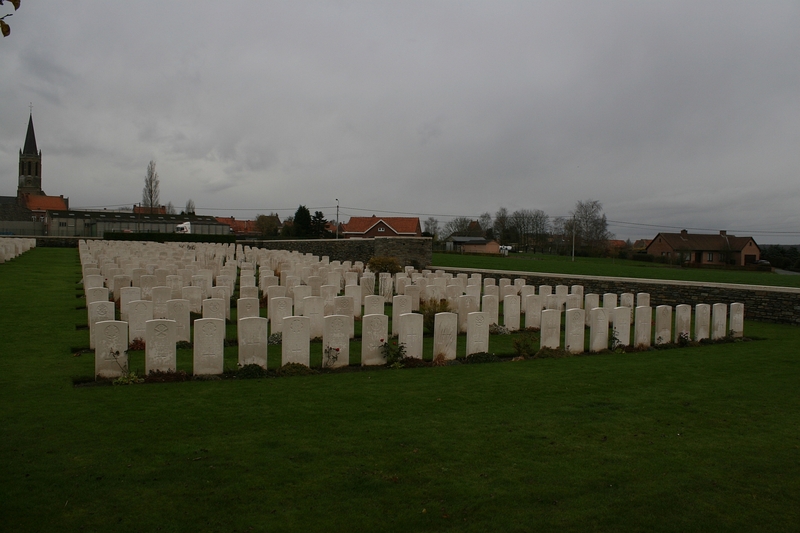 *There’s a link to this earlier visit at the end of the post. 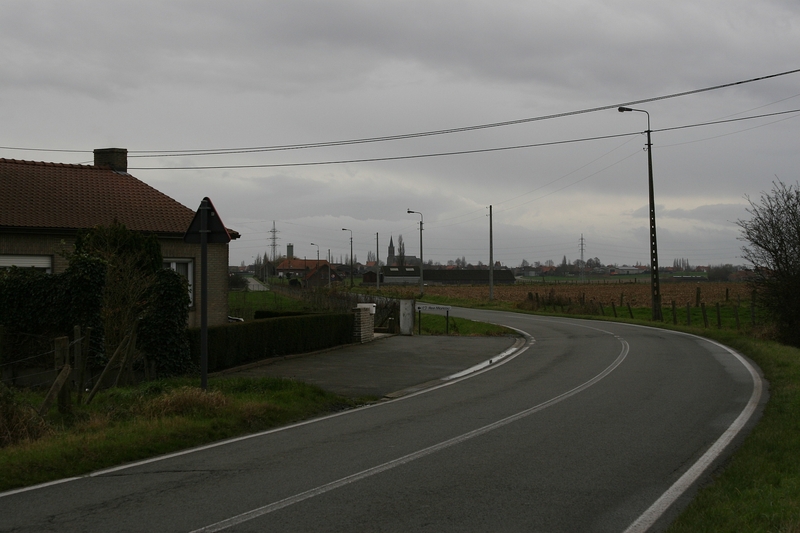 The road to Zandvoorde from the north. 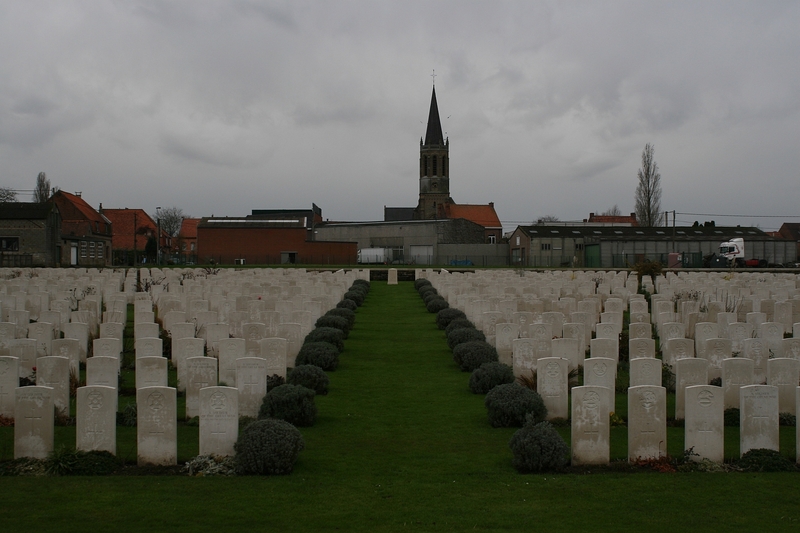 The spire of Zandvoorde Church can be seen (on the horizon in the centre of the photograph), as can the slight ridge upon which the village itself sits, a ridge that the British were striving so hard to defend in late October 1914. 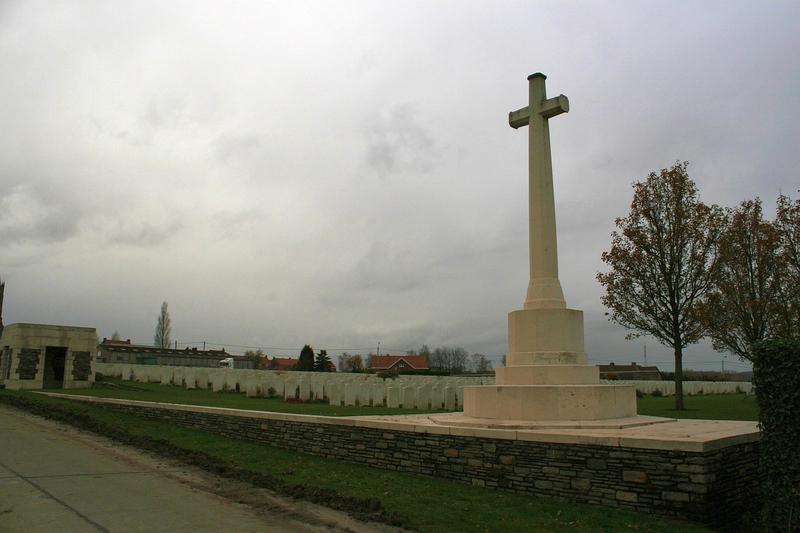 …towards the Cross of Sacrifice, visible within the cemetery a couple of hundred yards down the road. 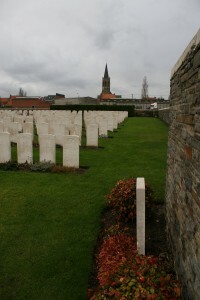 The Cross is situated in the south eastern corner; the cemetery entrance is the structure to the left. 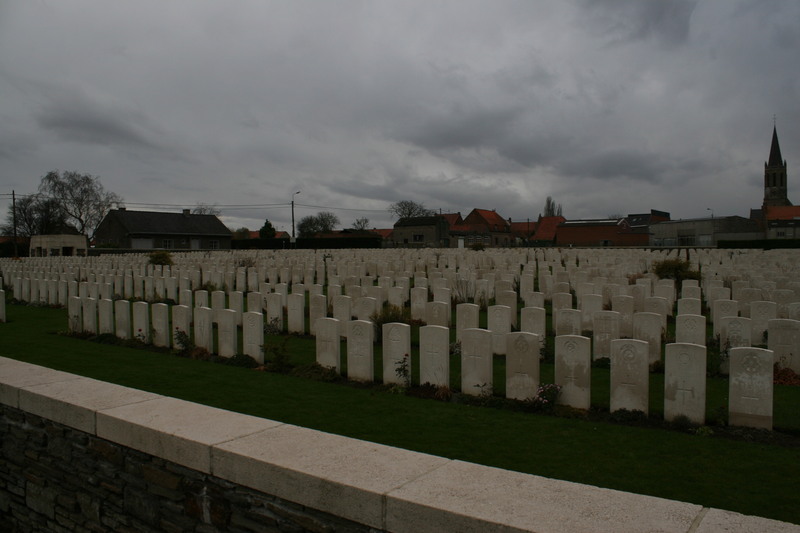 Looking west across the cemetery from in front of the Cross of Sacrifice. 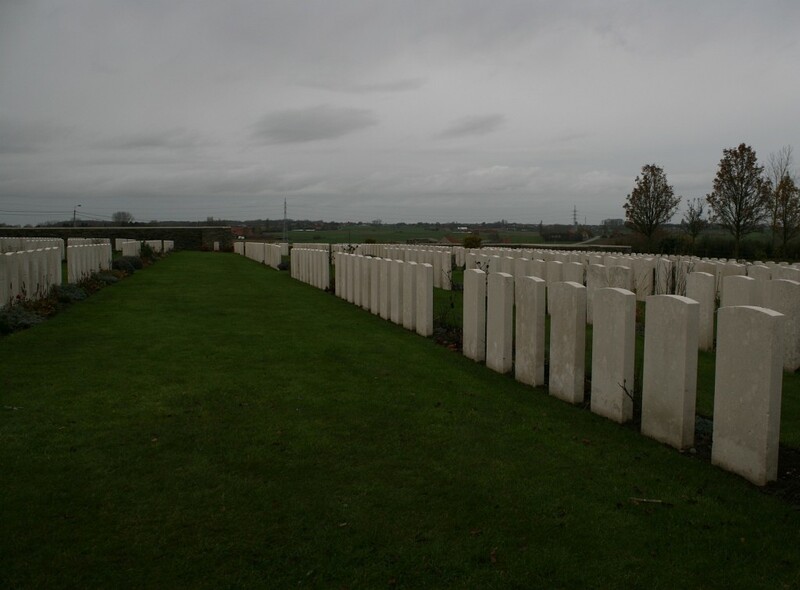 The headstones surrounding the special memorial, sixteen on each side, are memorials to the 32 soldiers commemorated on the stone itself (see below). 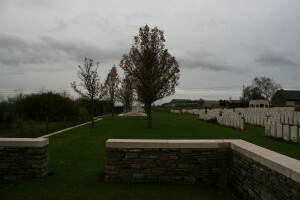 View from behind the memorial looking east towards the Stone of Remembrance, centre distance, and the Cross of Sacrifice (far right). 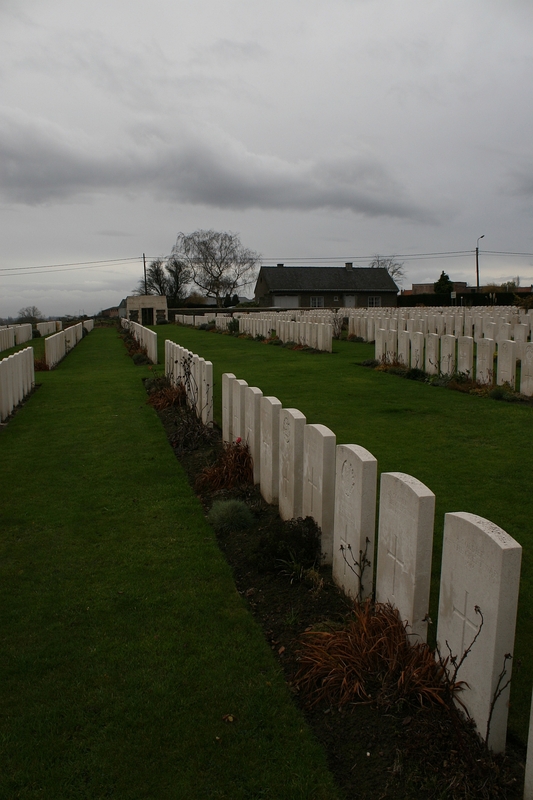 The vast majority of the burials here are sadly unidentified, and these ten headstones in Plot IV Row L bear not a single name among them. 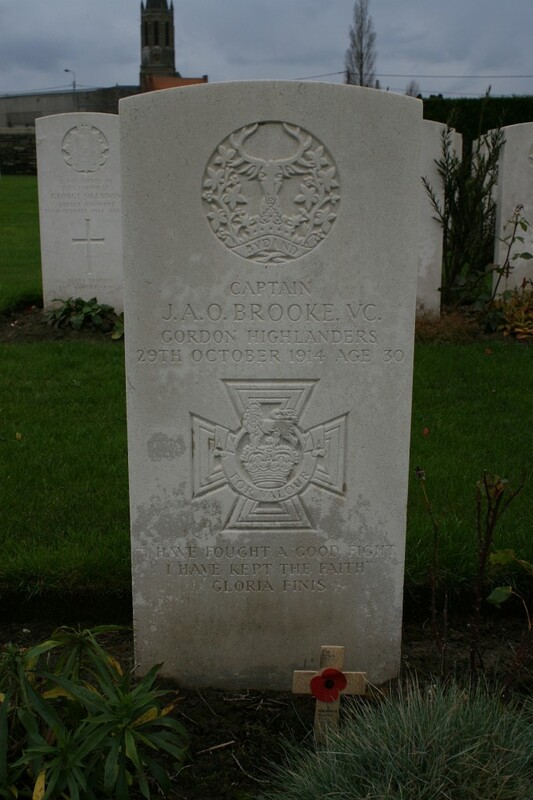 The first of two Victoria Cross holders buried in Zantvoorde British Cemetery, Captain James Anson Otho Brooke won his VC south of Gheluvelt on the morning of October 29th 1914 when, after leading two counter attacks by the 2nd Bn Gordon Highlanders, he successfully regained and held a strategically important trench against vastly superior German forces. 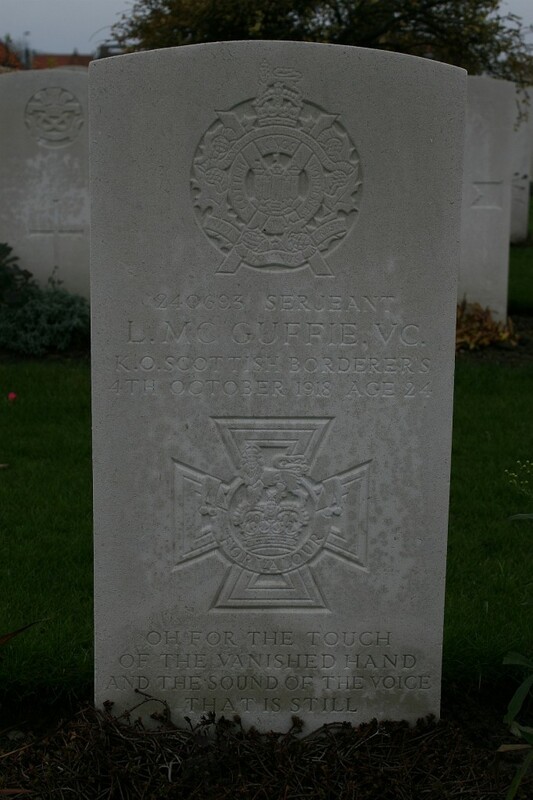 His VC was awarded posthumously as, tragically, he was killed by a sniper later that day. 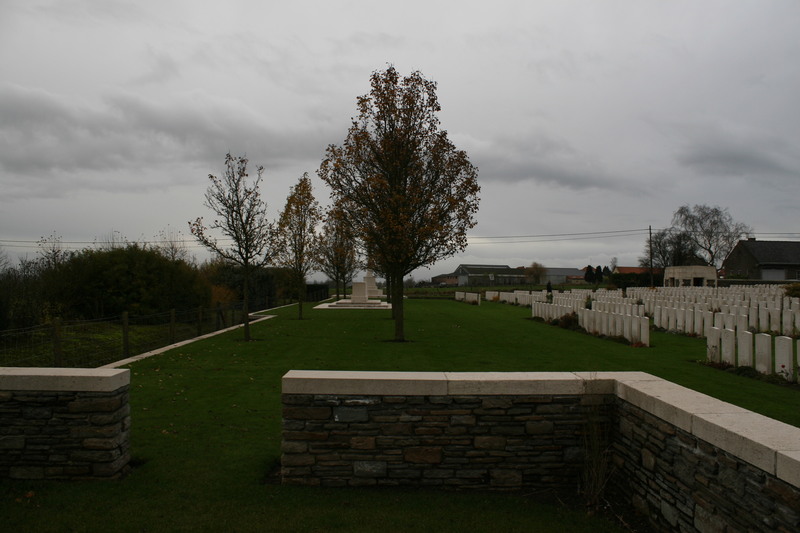 These views look south and east from near the special memorial headstone to Private Spencer of the Somerset Light Infantry (see Zantvoorde British Cemetery – Part One) on the far right, towards the cemetery entrance (in the distance, far left). The headstones nearest the camera are those of Plot V Row J; the majority of the other headstones visible in the middle and right photographs are those of Plot VI. 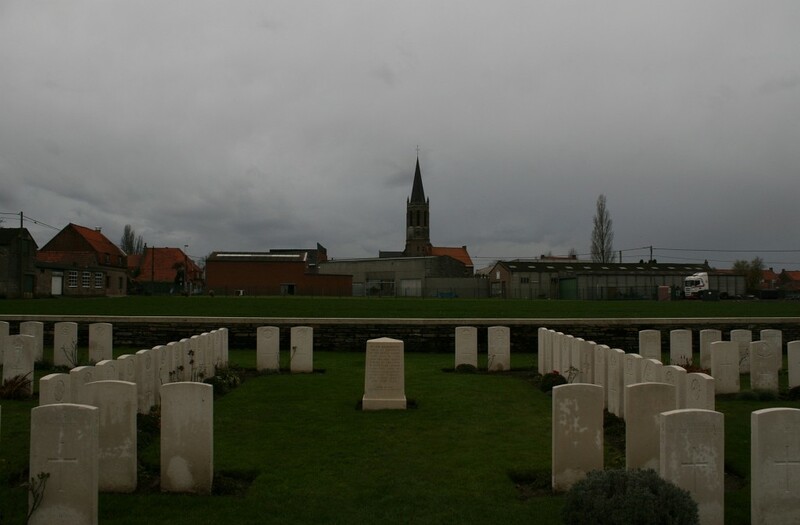 Baldrick stands before the grave of the second of the VC holders buried in this cemetery. 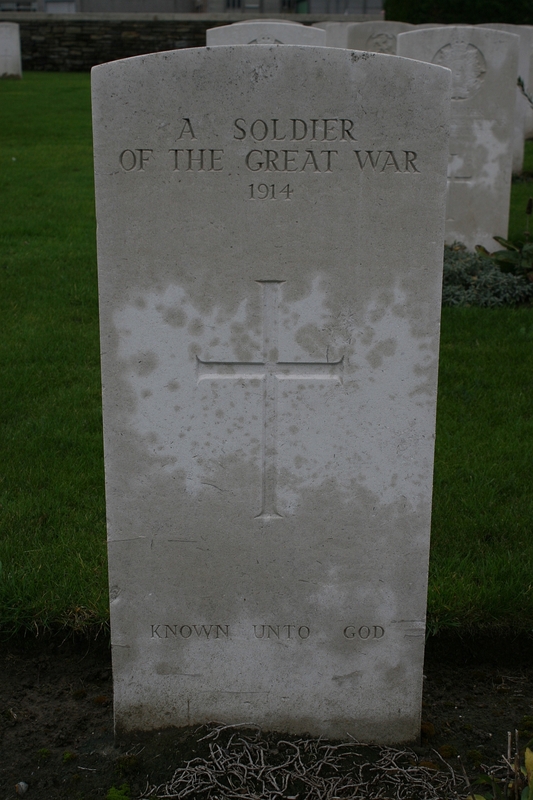 We shall join him shortly. 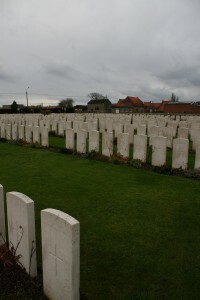 Views looking south and west from the north east corner of the cemetery. 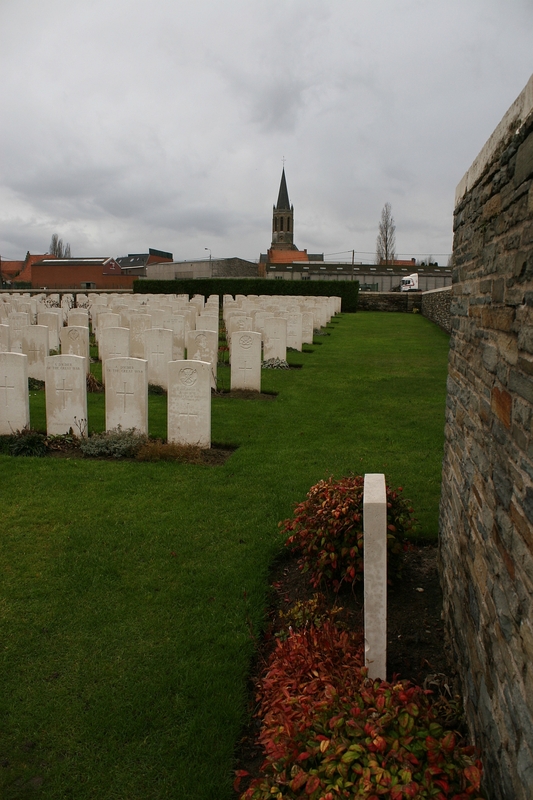 Plots V and, beyond, Plot VI, on the northern side of the cemetery. 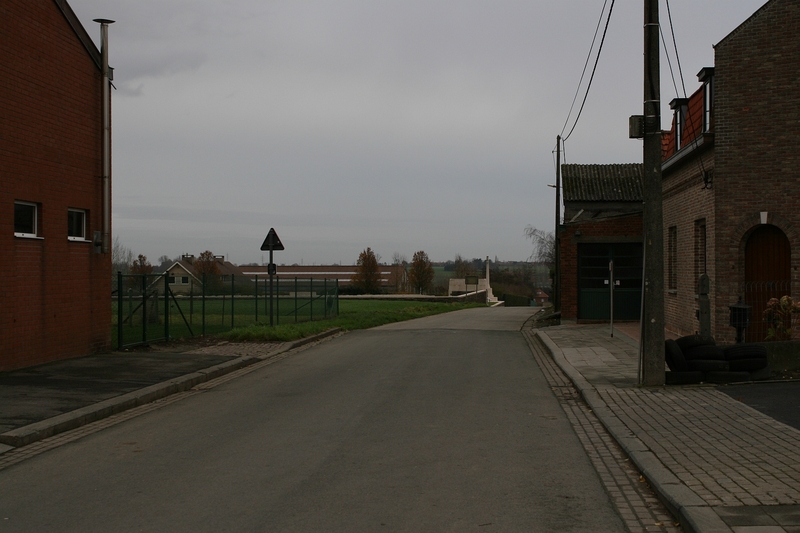 Plots II and, beyond, Plot IV. 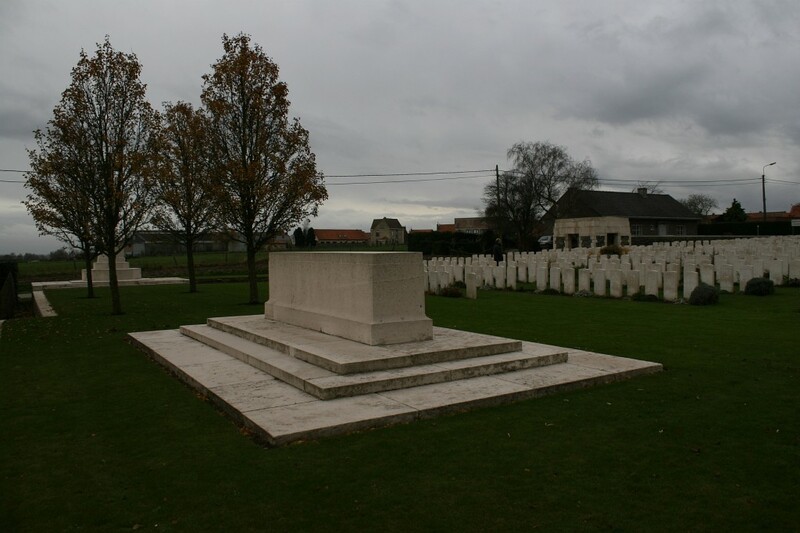 The Stone of Remembrance with the headstones of Plot I to the right. Panoramic view of the whole cemetery from the eastern boundary. 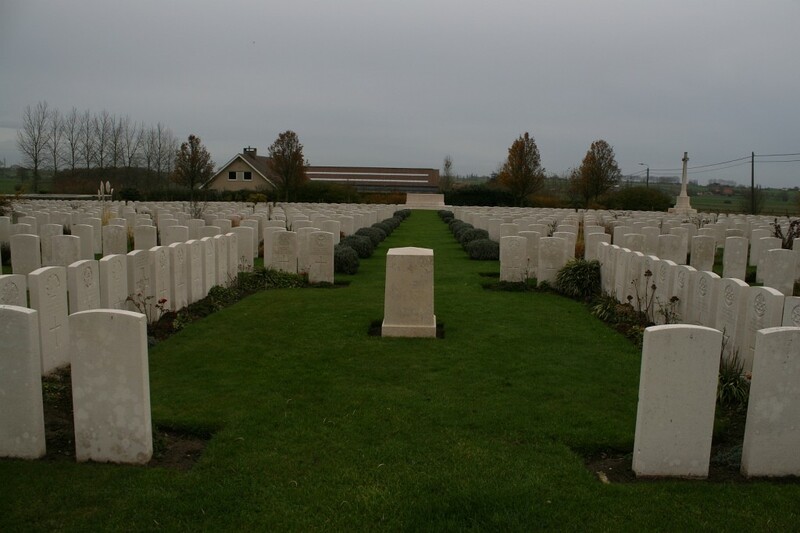 The second Victoria Cross burial here, Serjeant Louis McGuffie of the King’s Own Scottish Borderers won his VC on September 28th 1918, nearly four years after Captain Brooke. 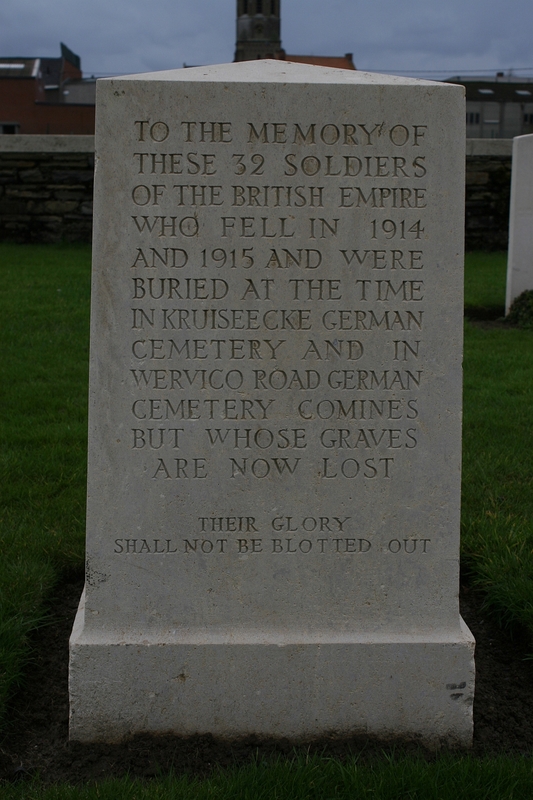 During the British attack to retake the Wyschaete ridge north of Messines, McGuffie, having been in action since early morning, and under heavy enemy fire from a machine gun that was holding up the advance, entered a number of German dugouts taking 26 prisoners (including a German officer) and saving some British soldiers who had themselves been captured, before taking many more German prisoners whilst in charge of a platoon later in the day. 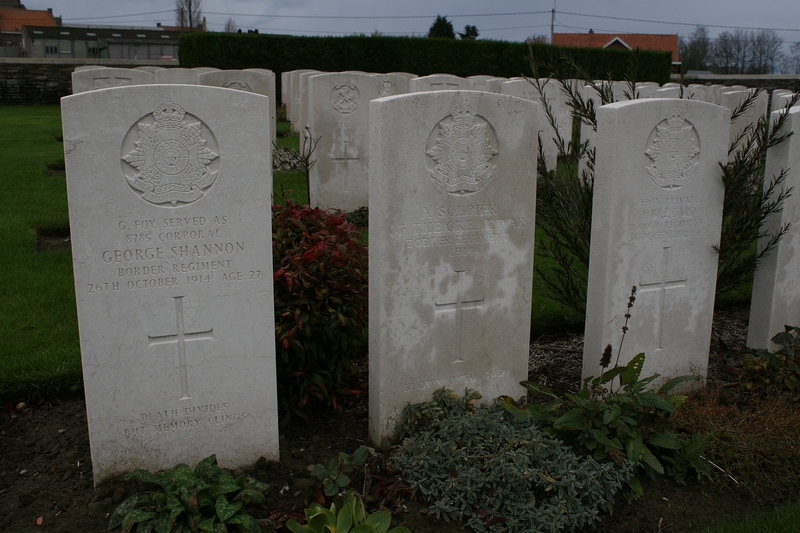 He was killed by a shell six days later. 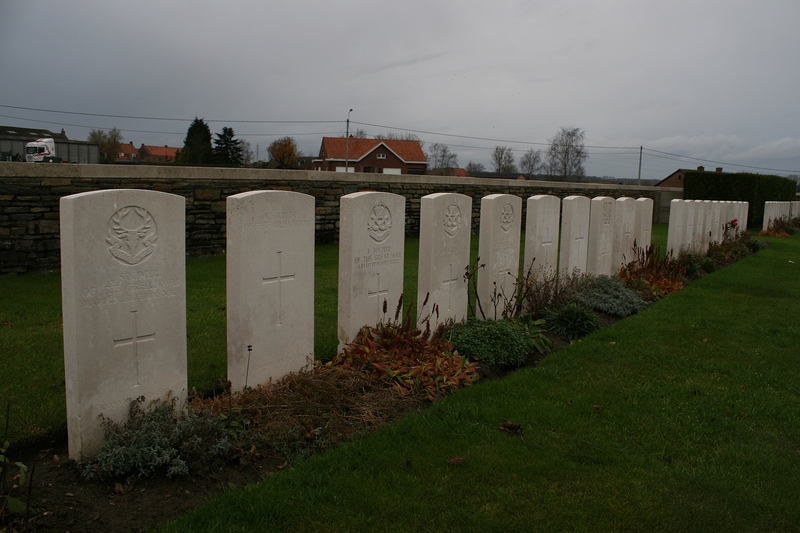 Four Durham Light Infantry men, two per headstone, all killed on October 1st 1918, and all with the same grave reference. 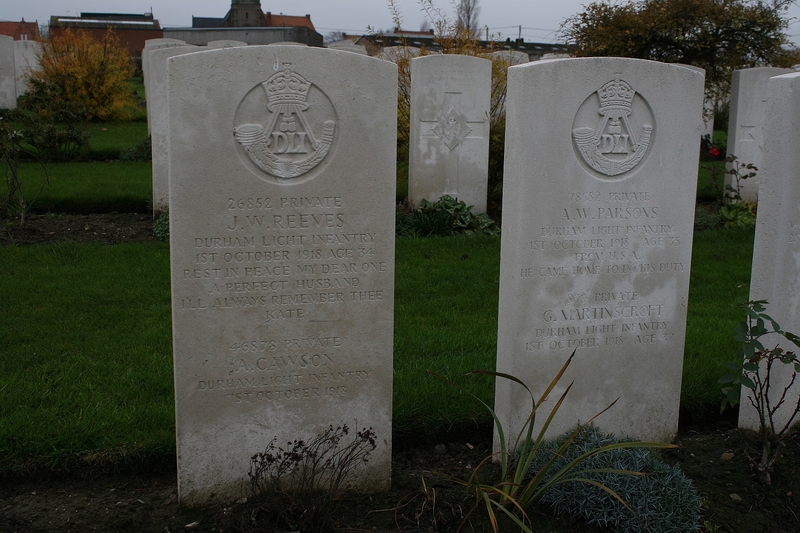 The personal inscriptions for Privates Reeves & Parsons make tragic reading. 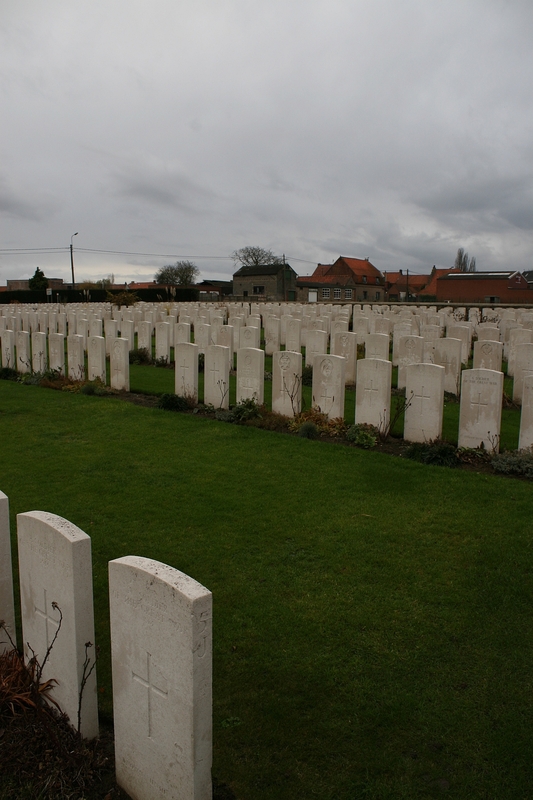 … and to the left, Plots III (nearest camera), IV and, furthest from camera, VI. 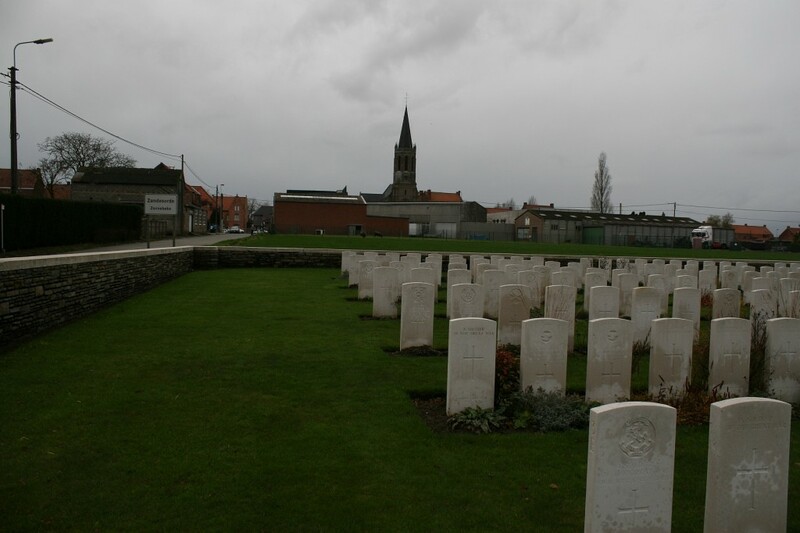 earlier visit to the cemetery first. 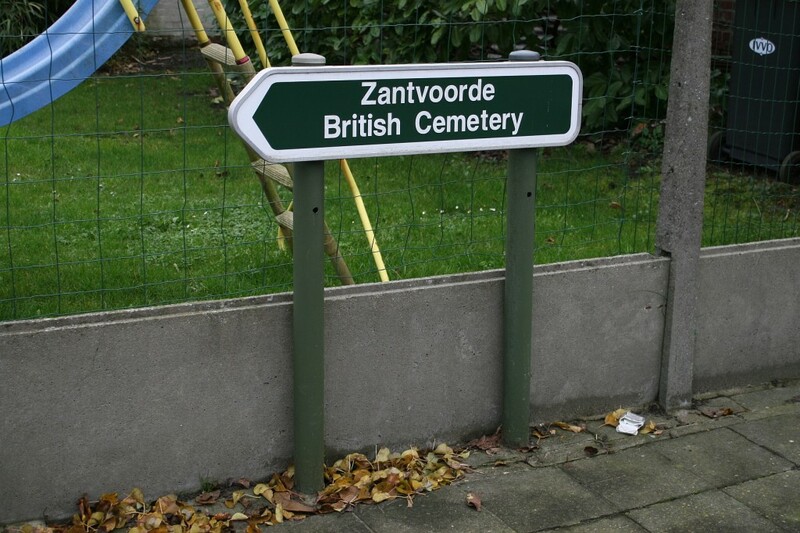 This entry was posted in Zandvoorde. Bookmark the permalink.